Highwaymen MC NY Crush Suit Into Road Kill | FreeOnePercenter.com… Home of B.A.D. ← B.A.D. Biker Rights Gets Its BUZZ On With BAD Alert! 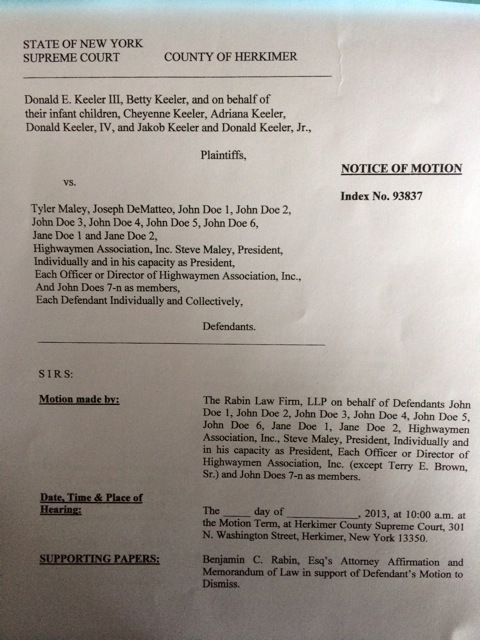 The suit, Keeler v. Highwaymen MC NY, filed in Herkimer County Supreme Court was dismissed this past week based upon a motion by the bikers attorney, Benjamin Rabin, of the RabinLawFirm in Syracuse, NY. 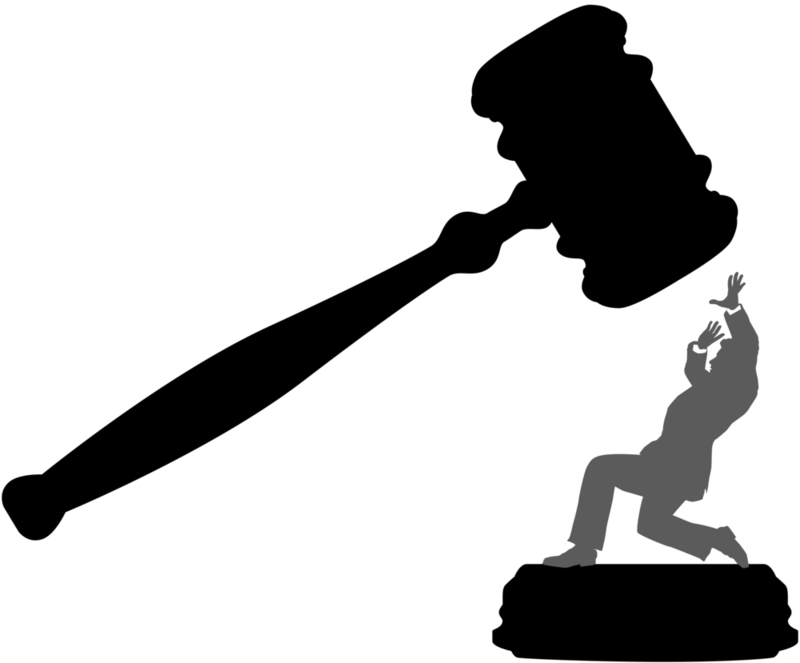 “Although it took some time, the civil justice system in this case worked. 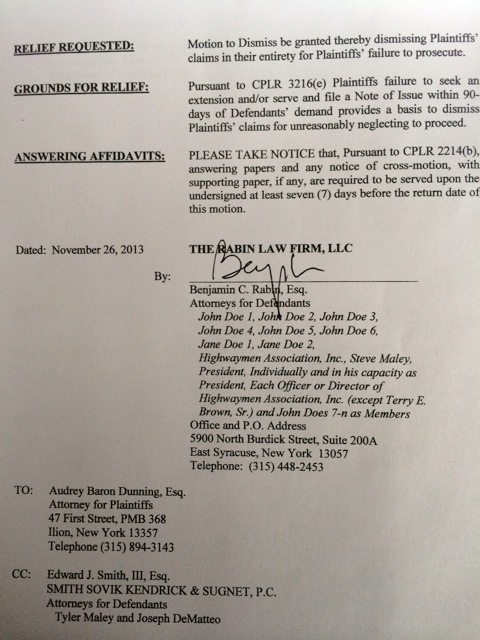 The action was dismissed. I am proud and honored that I was able to contribute to what I feel was vindication for The Highwaymen,” Ben Rabin stated. 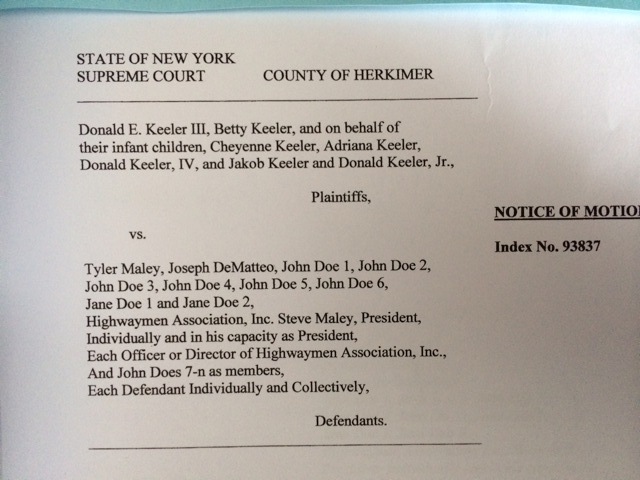 This was actually the second dismissal achieved by the Highwaymen MC NY from the same case in two parts – The first, defended by Attorney Ted Smith of Smith,Sovik, Kendrick & Sugnet in Syracuse,NY, handled the dismissal of the suit against, both, Tyler & Peeps, on August, 2013. Steve Maley, President of Highwaymen MC NY (not affiliated with any other similarly named MC in U.S. or abroad) stated in response to the dismissal: ”When you are in the right the truth shall prevail”. Many in the biker culture remember the “Tyler & Peeps” case where two biker club brothers were unjustly arrested, charged and convicted in Herkimer County, NY – One for being attacked by a posse of biker hate mongers in a bar primarily because he is disabled (deaf and could not speak properly) and the other for defending his disabled brother whom he witnessed being attacked by a group of uncivilized drunken idiots. 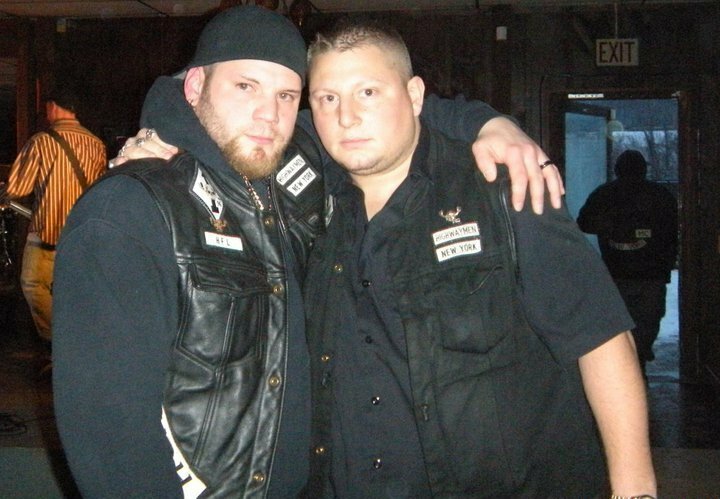 Neither biker, nor any other present, pressed charges against the attackers…Yet, they, themselves were arrested weeks later and charged under NYS Gang Assault laws as if they were the attackers! As an arrangement of sentencing, the court extorted $50,000 from the bikers to pay for victim compensation or the two would receive LONGER sentences in prison – an act of sheer injustice by the court. During the period of the Tyler & Peeps unjust conviction and imprisonment, B.A.D. reached nationally for assistance in the case which was covered by AlphaBiker.com, Spirit of Bikers Radio, BikerLowDown Radio, Hermis LIVE Show, BikerNews.net, Bikers Of America, NY Rider Magazine, ThunderRoads NY and a host of others across America seeking to shed light on the injustice suffered by all bikers in the culture. Bill Windsor of LawLessAmerica.com also traveled from Georgia to film testimony on the Tyler & Peeps case [LISTEN HERE} for presentation to Congress represented by Hank McGrath and to be included in aLawLessAmerica movie forthcoming on judicial and political corruption in America. Bikers Against Discrimination, along with Attorney Benjamin Rabin, biker rights advocates and club members Curt Byrnes, Mike Willig, Lisa Petrocelli, Dino Petrocelli, New York Rider Magazine, Robert Bar Porter , Eddie Sorez, John Kalament, Eddie Jidoun , Laquan Victoria, Noel Baker, Larry Scerri, “Giggles”, Sara Maley & son, local actor John Bard and a number of 1%ER clubs and other motorcycle clubs sponsored a campaign to open the nations first American Biker Culture Center & Law Library located in Ilion, NY and began an investigation into local corruption and facts of the case surrounding Tyler & Peeps. The Center’s opening celebration was hosted by the Highwaymen MC NY/! Hank McGrath, Director of the Center and a rights advocate, actually went uncover with the assistance of local professional film documentary producer and director, Harold Bryant, to research witnesses and claimants and found that the witnesses for Tyler & Peeps were never properly interviewed, that the alleged victim was not disabled as a result of any altercation with Tyler & Peeps, that the bar where incident occurred has had previous set-up convictions and incidents where they victimized others and the local authorities were personally involved with the alleged victims and, thereby, it is reasonably believed the “chain of evidence” was broken and tainted by the lack of actual film footage NOT being submitted in the case which clearly showed Tyler & Peeps innocence! Harold Bryant, of PopsMediaPro.com, also professionally studied the bar video tape with special investigative software and found detailed evidence of Tyler & Peeps innocence…Sad thing was, this was AFTER they were both already convicted! The evidence was packaged along with corruption reports from local area attorney’s given to Hank McGrath who, in interest of Highwaymen MC NY and the biker culture, went to Washington DC, with help of Boozefighters MC Chapter 80 and LawLess America to submit evidence of local court and official corruption to Congress and the US Justice Department. Months later after McGrath’s Washington DC visit, the “Us” Justice Department, Civil Rights Division sent the American Biker Culture Center a letter stating that after their careful review of the case they do not believe any civil rights were violated (especially with a disabled biker being unjustly attacked in a discriminatory way in a public place, etc.). As well, many already established “alleged” biker rights “poser” organizations and civil rights organizations across the US ignored our pleas for help on the issue!!! Robert “Bar” Porter, President of NYS ABATE stated recently in answer to the question would NYS ABATE fairly entertain a civil rights project proposal : “We will fairly entertain and consider any proposal submitted from biker rights groups, such as yours, and from any individuals who seek to help protect the culture and our rights.”: See Lisa Petrocelli’s Examiner article here: ”NYS ABATE steps up to the Bar“. He also will be representing the issues of civil rights at the May 2014 national NCOM meeting in Texas. In the meantime, The Highwaymen MC NY seek complete justice even though lives have been extremely disrupted and grave injustices suffered by those in the club as a result of the case. With the awakening of various clubs and rights advocate groups, their justice will empower a stronger path for all bikers in the culture in the United States and abroad! This entry was posted in News & Events and tagged American biker Culture Center, B.A.D., Bikers Against Discrimin ation, corruption, Hank McGrath, Highwaymen MC NY, Highwaymen MC NY win suit, Tyler & Peeps Case. Bookmark the permalink.